The Buccaneers are likely to have a new coaching staff in place soon, and none of their three quarterbacks are locked into 2019 roster spots. The oldest of those players, however, is not quite ready to retire. Ryan Fitzpatrick is leaning toward coming back for a 15th NFL season, Greg Auman of The Athletic reports (subscription required). 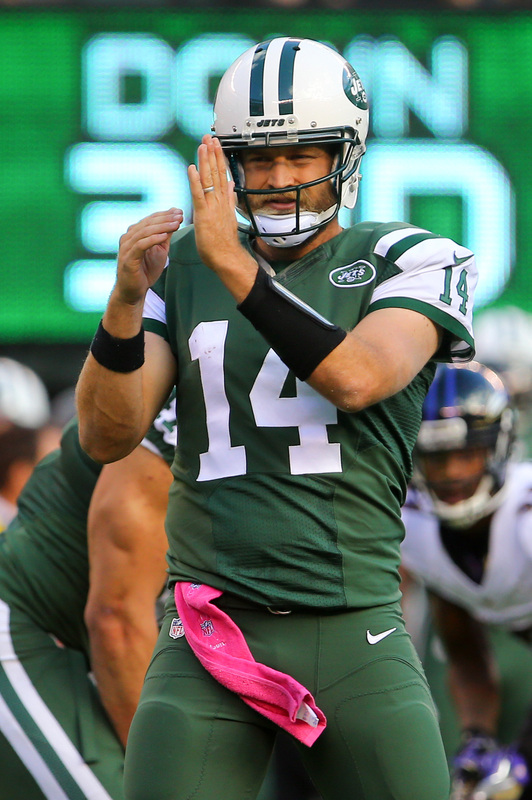 This week, Fitzpatrick will be the Bucs’ No. 3 quarterback, behind Jameis Winston and Ryan Griffin, Auman adds. 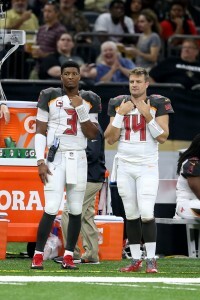 Although the Bucs’ highest point of the season came when Fitzmagic had them at 2-0, he was twice benched for Winston. The fourth-year Bucs starter has a guaranteed-for-injury $20MM salary for 2019, but it’s far from certain he will be back. 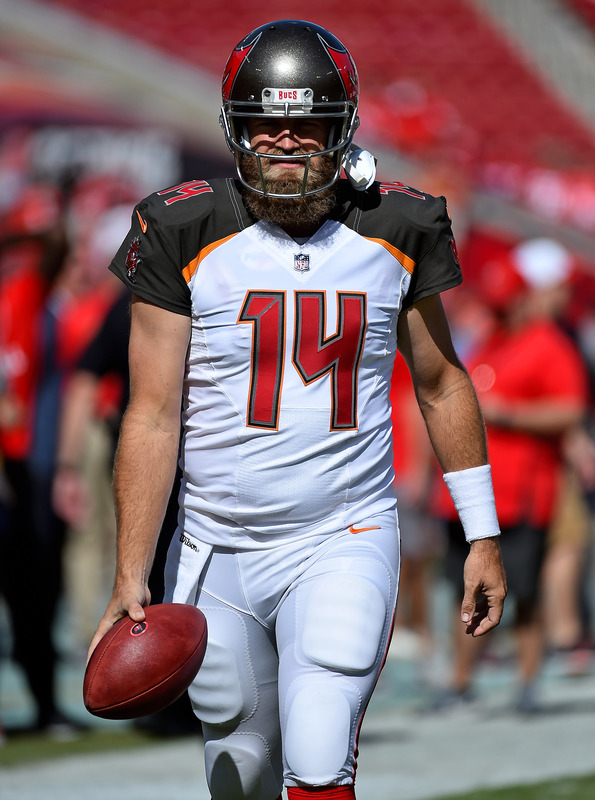 Fitzpatrick signed two one-year deals with the Bucs over the past two years, the most recent for $3.3MM. He will certainly attract interest from teams looking for a backup quarterback. Fitz has posted four 400-yard games this season, doing so in just seven starts, and still has a 9.6 yards-per-attempt figure to go along with a 66.7 percent completion rate. Free agency is set to include younger passers like Teddy Bridgewater, Tyrod Taylor and (probably) Nick Foles. They may receive more attention as bridge-starter-type options. Joe Flacco and Ryan Tannehill are also rumored to be available, complicating next year’s market. But Fitzpatrick could receive a look as well from teams looking for mentors/stopgaps for their to-be-determined rookie signal-callers. The Bucs shouldn’t be ruled out on this front, either, particularly if they do choose to move on from Winston. The Buccaneers will turn the starting job back over to quarterback Jameis Winston for Sunday’s game against the 49ers, according to Scott Smith of the team website (on Twitter). The move was expected after Winston played well in relief of Ryan Fitzpatrick on Sunday. After entering Sunday’s game against the Giants, Winston completed 12 of his 16 passes for 199 yards with two touchdowns and an interception on the final play of the game. Winston led the Bucs to touchdowns on four straight drives, leaving coaches with more confidence in him than in Fitzpatrick, who lobbed three interceptions. The 3-7 Bucs are likely out of the playoff picture, but these final six games will be crucial to Winston’s future with Tampa Bay. Winston is under club control through the 2019 campaign via the fifth-year option, but the option is guaranteed for injury only and the Bucs can escape the hefty $20.9MM price tag if they want to. There’s a risk that Winston falters and suffers a serious injury down the stretch, but head coach Dirk Koetter is on the hot seat and aiming to win now. The Fitzmagic is back in Tampa. On Monday, the Buccaneers announced that Ryan Fitzpatrick will start at quarterback in Week 9 over Jameis Winston. Winston began the year by serving a multi-game suspension and Fitzpatrick made the most of the opportunity. At least, he did for a little while. Fitzpatrick led the Bucs to upset wins over the Saints and Eagles in his first two weeks and nearly got the W over the Steelers in Week 3. Things fell apart for the veteran in Week 4 against the Bears’ top-notch defense, putting Winston back into the lineup. Unfortunately, the FSU product hasn’t fared well in recent weeks. On Sunday, Winston lobbed four interceptions and the Bucs offense only regained life when Fitzpatrick was called upon to lead the charge. The Bucs scored 18 points in the fourth quarter, but it was too little, too late as the Bengals won 37-34. The decision to bench Winston may have ramifications beyond the 2018 season. The former No. 1 overall pick is tied to the team through 2019 through his fifth-year option, but that option is guaranteed for injury only. If the Bucs keep Winston on the pine, they can move on from him this offseason without the specter of a $20MM+ obligation. Fitzmagic is no more. On Monday, coach Dirk Koetter announced that Jameis Winston will be the Bucs’ starting quarterback when they face the Falcons in Week 6. Winston was suspended for the first three games of the season and Fitzpatrick was stellar in his absence – at least through the first two games. Fitzpatrick had an up-and-down Week 3 against the Steelers and the wheels completely came off on Sunday against the Bears. When Winston took over, he outperformed the Harvard product by completing 16 of 20 passes for 145 yards and a touchdown. Winston threw a pair of picks in the process, but he still looks like the more promising option of the two. Winston is under club control through the 2019 season thanks to his fifth-year option. The option, guaranteed for injury only, is worth $20.9MM. 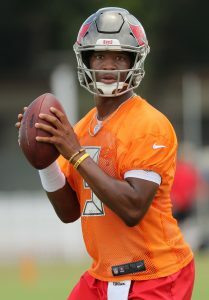 If Winston plays well from here on out, the Bucs will have an easy call to make in the offseason. If he falters, Winston could hit the free agent market, where he can still cash in due to positional scarcity. Active for the first time after serving his three-game suspension, it didn’t take long for Buccaneers quarterback Jameis Winston to see the field. The former first-overall pick replaced starter Ryan Fitzpatrick during the second half of Tampa Bay’s loss to the Bears today. The Buccaneers offense struggled mightily with Fitzpatrick in the game. Before being benched, the veteran quarterback had completed nine of his 18 pass attempts for only 126 yards. He also threw an interception and was sacked twice. Winston ended up finishing the game having completed 16 of his 20 pass attempts for 145 yards, one touchdown, and two picks. He also added a single seven-yard rush. After the game, head coach Dirk Koetter said Winston had probably done enough to earn the starting nod for his team’s Week 6 contest against the Falcons (via The Athletic’s Greg Auman on Twitter). Fitzpatrick got off to a roaring start this season, as he compiled at least 400 passing yards and four touchdowns in each of his first two games. However, the 35-year-old threw three interceptions during last week’s loss to the Steelers, and Koetter admitted to his team that he almost replaced the veteran with backup Ryan Griffin. Some wondered whether this was an attempt by the organization to lay the foundation for Winston’s inevitable return to the lineup. When the team announced that Fitzpatrick would be starting today’s game, they partly attributed the decision to the fact that Winston had had less than a week of practice under his belt. Koetter had previously said the coaching staff would reevaluate the quarterback position during the upcoming bye week. While Fitzpatrick may have won the NFC Offensive Player of the Week award following his performance in the Bucs’ first two games, it’s sounding like he’ll probably be riding the pine when the Bucs return to the field in Week 6. Although the Buccaneers could not conjure quite enough FitzMagic to pull off a comeback win against the Steelers on Monday, Tampa Bay will start Ryan Fitzpatrick against the Bears this afternoon, per ESPN’s Adam Schefter (via Twitter). This was the expected move given how well Fitzpatrick has generally played through the first three weeks of the season and in light of the fact that the team is on a short week this week. Plus, we heard earlier this month that Fitzpatrick would remain under center for as long as he performs at a high level. But according to Ian Rapoport of NFL.com, Tampa Bay head coach Dirk Koetter told his team during a meeting on Wednesday that he was “one or two plays away” from lifting Fitzpatrick on Monday night in favor of backup Ryan Griffin. At the time Koetter was contemplating that move, Fitzpatrick had just thrown his third interception and the club was trailing Pittsburgh 23-7. Koetter, of course, did not end up pulling Fitzpatrick, but the fact that he made his thought process known to his team took some Buccaneers by surprise. Some players simply took Koetter’s words at face value, but some wondered whether he was laying a foundation for Jameis Winston to return, perhaps as soon as Week 6 (Tampa Bay has a bye in Week 5). After all, the team still views Winston as its long-term quarterback, so it stands to reason that he will be under center at some point soon, even if Fitzpatrick continues to overachieve. Winston was not permitted to practice at the team facility during his suspension, but Laine writes that he brought in quarterbacks coaches George Whitfield and John Beck and longtime trainer Otis Leverette to help him maintain the same schedule he had with the Bucs, and the group conducted daily workouts with 25 free agents and former teammates. Reading between the lines, it certainly seems as if Winston may be starting for the Bucs in Week 6. Antonio Brown‘s decision to skip practice on Monday represented a culmination of months of tension between the Steelers and their All-Pro receiver, according to Jason La Canfora of CBSSports.com. Brown was upset earlier this year after being told that his personal trainer and social media manager would no longer be welcome on Pittsburgh’s practice field, and some within the organization believe his multi-day absence during training camp — ostensibly due to a injury — was instead related to his disappointment. Ultimately, the Steelers believe Brown simply wants to win, but there is reportedly also concern with the club that quarterback Ben Roethlisberger‘s close relationship with offensive coordinator Randy Fichtner (and his subsequent influence on play-calling) could cause more strain in the locker room. Bengals running back Joe Mixon could potentially return to the field in time for Week 4, per La Canfora. Mixon underwent knee surgery immediately following Cincinnati’s Week 3 Thursday night victory, and initial assessments indicated he could be sidelined two-to-four weeks. However, because the Bengals played mid-week in Week 3, Mixon’s timeline could be sped up, meaning he could return to action when Cincinnati faces Atlanta next Sunday. A second-round pick in 2017, Mixon was outstanding during the Bengals’ season opener, averaging more than 5.5 yards per carry on the ground while adding five receptions in the passing game. Backup Giovani Bernard is holding down the fort while Mixon is out, while the Bengals also have Mark Walton and Thomas Rawls on their running back depth chart. Ryan Fitzpatrick is unlikely to be replaced as the Buccaneers‘ starting quarterback no matter how he fares against the Steelers on Monday night, reports La Canfora. While Jameis Winston will come off suspension prior to Week 4, Fitzpatrick has been among the league’s best quarterbacks through two games, as he leads the NFL passing yardage while racking up eight passing touchdowns. Fitzpatrick has internal support within the locker room (and especially from Tampa Bay’s offensive line), so the club’s coaching staff is unlikely to make a change any time soon. The Buccaneers face the Bears in Week 4 before heading into a bye the following week. The Raiders will move to Las Vegas either in 2019 or 2020, and they could potentially need a temporary stadium for the 2019 campaign if no extension with the Oakland-Alameda County Coliseum Authority can be reached. With that in mind, the Raiders have contacted the city of San Diego about playing there next season, says La Canfora, who notes that such as possibility is viewed as remote. More likely, the Raiders will play one year in Oakland, or spend next season sharing Levi’s Stadium with the 49ers.